The spring and summer months have always been slow periods for the global internet poker economy, but some regions—particularly New Jersey—have clearly struggling more than others. For the month of June 2015, the NJ online poker market suffered the lowest yield since the state introduced regulation in 2013. Last month, the Division of Gaming Enforcement (DGE) reported that NJ online poker operators harvested just $1.83 million. That figure represents a 46.8% drop compared to the state’s all-time high of $3.44 million generated in January 2014. Diminishing player traffic—and consequently, revenue—is expected around this time of year. The iPoker industry endures a seasonal drop in activity all over the world. But the NJ online poker market has more reason for concern when comparing last month’s revenue to that of a year ago. June 2015 bears a 10% decrease compared to the same month’s figures in 2014. In fact, aside from the relatively steady months of February and March, New Jersey has witnessed a perpetual month over month decline in internet poker revenue. On the opposite end of the spectrum, regulators in the Garden State are enjoying a continuous boost from the online casino market. That division nearly struck 10-figures in June, reaping $9.83 million; a staggering 83.38% more than NJ online poker sites. 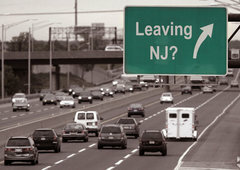 There is some confusion among which network actually leads the NJ online poker market. If we go by revenue, the Party Borgata Network is at the forefront. Based on cash game traffic numbers from tracking website PokerScout, however, it’s WSOP/888 that leads the pack. There are only two internet poker networks operating four sites in the Garden State. Party Borgata operates nj.Partypoker.com and Borgatapoker.com, while Caesars Interactive’s WSOP.com and us.888Poker.com share they’re players on WSOP/888. When comparing NJ online poker revenue, Party Borgata is on top with 51.8% of the market share, while WSOP/888 follows right behind with 48.2%. In terms of traffic however, WSOP/888 appears to have a significant lead of 170 average cash game players, compared to just 110 on Party Borgata. One would have to surmise that Party Borgata is drawing more tournament traffic, and/or higher stakes players to the virtual felt. When balancing the books for both NJ online poker and casino markets in June, Party/Borgata remained on top by claiming 29.6% of the Garden State’s overall iGaming market share. Caesar’s Interactive came in second with 22.6%. Tropicana and Golden Nugget, which operate online casinos only, trailed close behind with 21.95% and 21.64% respectively. Another casino-only operator, Resorts’ grade was negligible, managing to grasp just 3.43%. At this point, there’s only one thing that can truly turn the NJ online poker market around, and that’s the eventual introduction of PokerStars. The world’s largest internet poker site, owned by Amaya Gaming, is still waiting for a ruling from state regulators on whether a license will be granted, and according to Amaya CEO David Baazov, it could happen as early as Fall 2015. PokerStars entry should have an immense impact on the Garden State, raising awareness ten-fold and giving existing operators significant reason to become more competitive with their promotions and tournament offerings. It’s also worth noting that Amaya Gaming is currently in negotiations to acquire bwin.party and its many interactive gaming assets, including its operations in New Jersey. Update: Confirmed this morning, July 17, 2015, 888 Holdings has won the bid for bwin.party, agreeing to a $1.4 billion buyout of the company and all of its assets.